Last week, thousands of women marched through Santiago, Chile, in a demonstration organized by university students to protest sexual harassment and violence against women on campus. The demonstration followed an even larger one the previous Friday protesting violence against women. In an email interview, Kirsten Sehnbruch, an associate researcher at the Universidad de Chile and the Centre for Social Conflict and Cohesion, and Patricio Espinoza, Atlantic Fellow for Social and Economic Equity at the London School of Economics’ International Inequalities Institute, discuss the current protests and how they fit into Chile’s broader student and feminist movements. World Politics Review: What is driving the current protests against sexual violence in Chile’s universities? To what extent do they grow out of the Chilean student movement that mobilized for school reforms in the past, and to what extent do they represent something new? Kirsten Sehnbruch and Patricio Espinoza: The recent protests were triggered by a case of sexual harassment that occurred in the Law Faculty of the University of Chile, to which the university authorities did not respond promptly or adequately. However, they also reflect a broader concern with the historical and generalized gender discrimination to which female students are subject in Chile, and for which universities have failed to establish appropriate and effective institutional responses. Beyond the specific case of the Law Faculty, the current movement describes itself more broadly as feminist, with the stated objective of eradicating sexual harassment and closing the gender pay gap, in addition to establishing equal academic opportunities for women and men. This new movement is distinct from the student movement that mobilized more than 1 million students across Chile in 2011 and sought broad structural reforms to the Chilean education system, such as free education and the acceptance of education as a universal right. Nevertheless, it is also born out of the very organized, articulate and politically active student unions based at all public and many private universities in Chile, which have the capacity to mobilize students quickly and effectively. Thus, this new student movement is also articulating the broader concerns of students, has the ability to put these concerns on the national policy agenda, and could provide the impetus to potentially transform socio-cultural values that so far have plagued Chilean society. 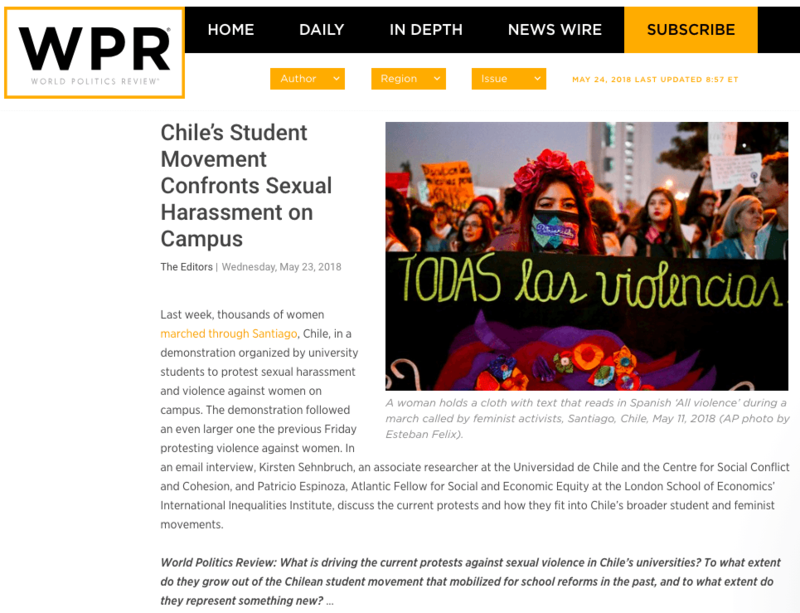 WPR: How do these protests fit into the broader picture of women’s rights and sexual violence in Chile and activism to improve women’s status? Sehnbruch and Espinoza: The current student protests are a continuation of previous protests that have attracted national attention. Since 2007, a campaign against violence against women using the slogan “Cuidado! El Machismo Mata”—or “Careful! Machismo Kills”—has mobilized public opinion through annual marches and other activities. In 2016 and 2017, thousands flocked to the streets under the slogan “Ni Una Menos”—or “Not One [Woman] Less”—to protest violence against women, femicides and the slow judicial response to a particularly horrific case of violence against a woman, Nabila Riffo, who was brutally attacked and blinded by her partner. This activism to improve the status of women in Chile has the potential to gradually bring the country in line with international standards, and it has already achieved some positive results. For instance, the government established a Ministry for Women in 2016, which is charged with formulating and implementing policies designed to advance gender equality and prevent violence against women. In 2017, legal abortions were reintroduced, albeit under narrowly restricted circumstances. However, Chilean society still suffers from systematic gender discrimination across different spaces. Private gender discrimination within the household as well as public discrimination within institutions and at the workplace is commonplace, and levels of sexual harassment, violence and even femicide remain high. The movement triggered by students of the University of Chile is thus extremely significant, as it forces one of the most important institutions in the country—the university system—to review its institutional protocols, and establish procedures and sanctions with regard to sexual harassment and violence. The impact of the movement is highlighted by the fact that the Ministry of Education has already established a working group to discuss the issue. Numerous deputies and senators in Congress have also expressed their support as well as their willingness to propose new legislative measures. WPR: How politically potent is the broader student movement currently, and how much do its grievances and demands resonate outside the university among the population at large? Sehnbruch and Espinoza: The Chilean student movement must be characterized as one of the most successful social movements of recent times in Latin America, as it was capable of generating structural educational reforms that were implemented under the recent government of former President Michelle Bachelet between 2014 and 2018. These reforms established free secondary education, significantly expanded access to free higher education, prohibited profit-making with public funding in the education sector, and established education as a basic social right for Chilean citizens. In some ways, the movement has been a victim of its own success, as its momentum and ability to mobilize fizzled out after the government incorporated students’ demands into its own policy agenda. But perhaps more importantly, the student movement established itself as a political force to be reckoned with over a very short period of time. Former student leaders were elected to Congress in 2014, where they founded the Frente Amplio, a political coalition that articulates the demands of the left-wing social movements. In the 2017 presidential election, Frente Amplio put forward its own presidential candidate, Beatriz Sanchez, who, although she didn’t win, garnered an unprecedented 20 percent of the vote in the first-round ballot. In this context, the current demonstrations of the student movement against gender discrimination, which have paralyzed many faculties in universities across the country, will serve as a new impulse to the student movement overall, as it seeks to pursue broader social demands under President Sebastian Pinera’s center-right government, which took office this year. However, they also signal that social mobilization in general has become a consistent feature and a powerful political force in modern Chile.